What is art? Well in my house it's whatever I say it is, and I imagine the same goes for you. I love fine art (i.e. real paintings) and I have a couple pieces, hopefully more in the future, but that doesn't mean random things I pull together or design that I enjoy or create can't fill spaces on my wall and do so beautifully. 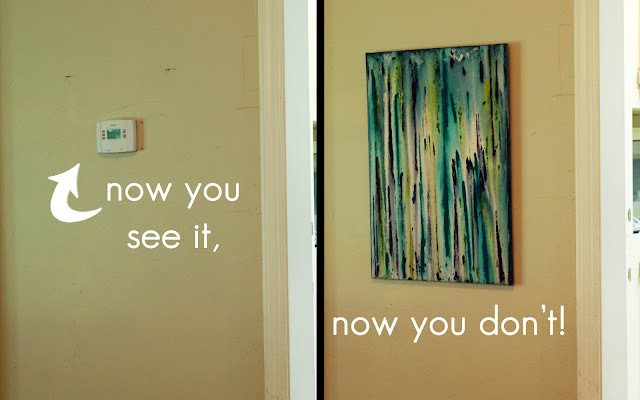 Case in point, my new paintings. I have no idea how to draw or (artistically) paint, and scary words like shading and gesso make me cry. However, I needed something in my dining room to pull in some of the neighboring living room's colors as a starting point for the sorting out of said dining room. And since eventually I want to remove walls and make these rooms one big fabulous space, I might as well be decorating them in ways that will work together. Enter fabulous blog post idea and genius David Bromstad technique video. Um, I could do that... I think. 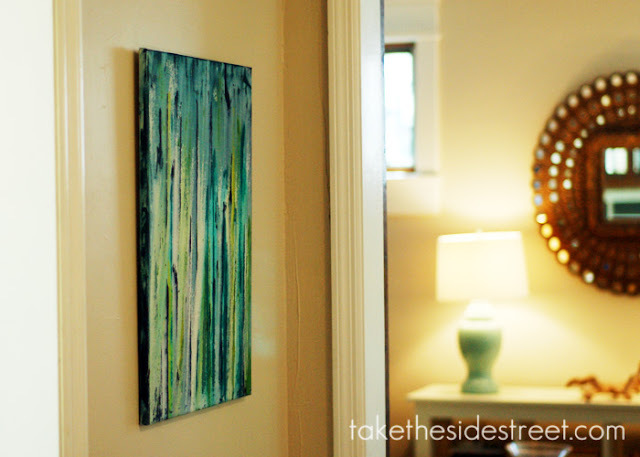 Step 1: Get yourself a canvas. 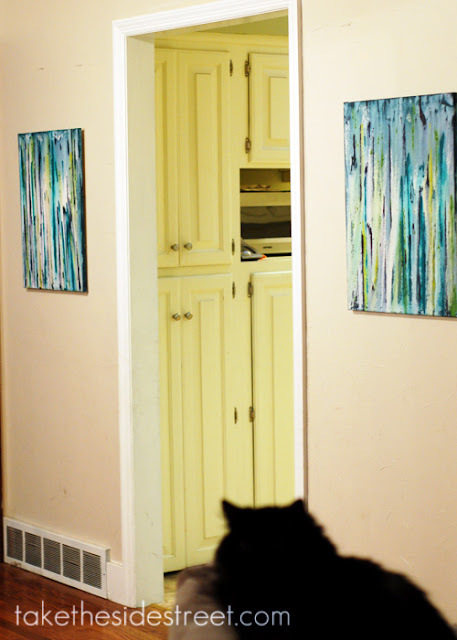 I bought a pack of two 18x24" canvases -- with my 40% off coupon it came to $9 and change. Step 2: Gather your tools. I don't like to make decisions so I grabbed a whole bunch of craft paint and decided to pick colors in the midst of my creative fog. I was pretty sure I'd be overtaken by some artistic zone... I'm optimistic like that. You'll also need a water bottle. 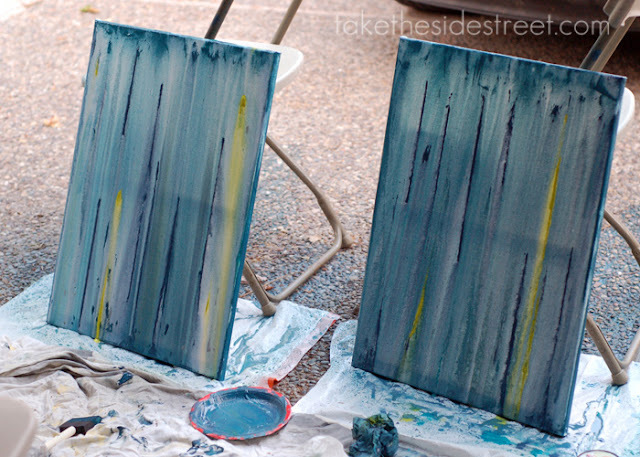 Step 3: Mist the canvas down really well -- you want the paint to run. Step 4: Mist it some more. Really, don't be afraid... wetter is better! By the time I was done I had refilled my bottle 3 times because I kept 'starting over' in frustration and my canvas came through like a champ! 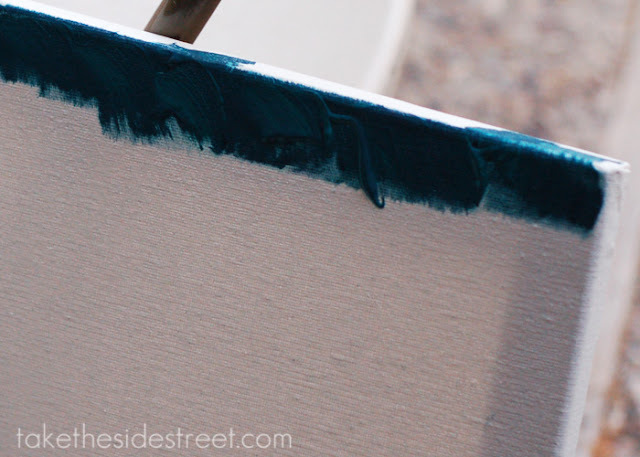 Step 5: Glob on some paint along the top -- I mixed my two blues together (a bright turquoise and a dark navy) and brushed it on. Get lots on, and I smooshed it all over so there weren't subborn globs that wouldn't run. 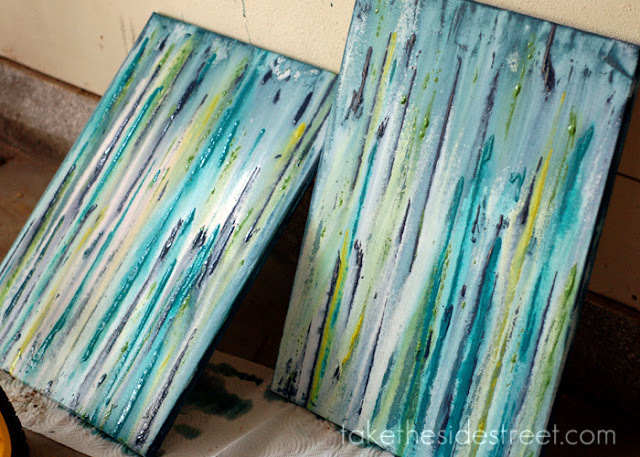 Step 7: Add some more paint if you want -- I added more of both blues, and then a couple greens. David Bromstad suggests limiting your colors otherwise they run together and become muddy and I think that's a good idea. 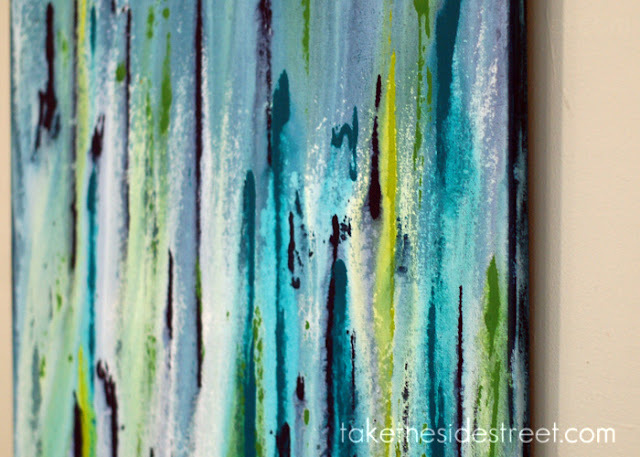 I ultimately dripped my individual colors directly onto the wet canvas (keep misting it so it's nice and wet!) and let them drip down for a less mixed together look. Step 8: While your painting dries, take a magic eraser to your now blue folding chairs and driveway and vow to plan better next time. I really think I like them. Mike says he likes them and told me they remind him of looking out a car window when there's rain all over them and you can just see glowing colors. I think that's a compliment, so I'll take it! In fact, I'll name the pair 'Rainy Windows' and consider myself an accomplished artiste. Love these, I think I may try these with my kids. Ohhh! I love these great job! I want to make some humungo ones! These are stunning! Great job again!!! Totally cool! I love these....yours turned out great! Thanks for sharing this technique. 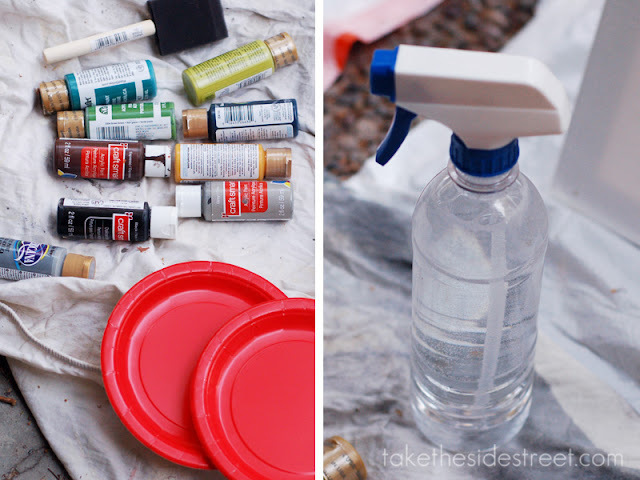 I never thought about using water and having the paint run to make a design. FAB. U. LUSS! And I'd definitely consider that a compliment from the man. Mine never has anything nicer to say than 'wow, I didn't think it would turn out good enough to sell'. Yeap. My treasure. I'm totally going to try this. I always watched DB do this on his show, but I never really thought it was that easy! Wow! I really love them! I could see doing something like that for myself and then using it as a background for something. Then again, I have to make things more complicated than they need to be. I generally stick to digital drawing because the only thing I end up wasting is time - and there's always an "undo" button. David Bromstad = yummy. Oh, the things I would do just to watch him paint in my house. I love the name! I totally need to do something to cover my thermostat! What a great project! And love that you covered the thermostat. I just did the same thing at my house a few months ago! I can't believe they're that easy to make, yet they look like something you'd pay three figures for in an art gallery. Awesome! I love this, maybe something I could do with my kids, thanks for the idea! These are so gorgeous I would pay you to make these for me!! They're awesome!! And that looks like such a fun technique to try. Might be a good project to do with my daughter. Looove! Looks like fun, can't wait to try it out for myself!! Finally, I found your post again! I've been looking for weeks - remembered the beautiful results but couldn't recall the blog!! Thank you for the inspiration. I tied it and the result is great. I wish I could upload the picture to share, but it doesn't look like I can. Oh my goodness! Thank you so much for pointing this DIY project out to me!